Permission to quote from this transcript must be obtained from Oral History and Folklife Research. Please contact OHFR for further information. 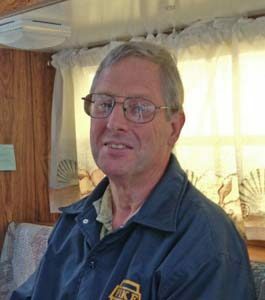 Description: Ralph Poland was born July 31, 1954 in Englewood, CA, and spent most of his life in Maine and New England. He has worked as a handyman and has been active in Republican party politics. Poland suffered brain damage due to a heart attack and stroke, and now serves as an advocate for persons with disabilities. POLAND: People don’t tend to want to think about that [disability]. They do put blinders on, hoping that would never happen to them. but eventually disability will happen to us or somebody we know. NARR: Ralph Poland lives alone in a camper on a dead end road named after his father in New Gloucester, Maine. He’s a happy bachelor and former handyman who now works at Wal-Mart. But Ralph has spent the last ten years teaching himself to walk and talk again after suffering two strokes during open heart surgery following a heart attack. POLAND: I was working on an apartment for a friend of mine. I gutted it out. I kept feeling pain in my chest, felt like a chest cold. So, I just kept ignoring thinking that it’s going to go away; they always do. Take Vitamin C and so forth, a lot of fluids and it go away. One day I was working, I realized, man’s it’s been a month now and it’s not gone away. That can’t be a cold because colds don’t go on this long. So, the day before I was due to receive a truckload of sheetrock and start hanging sheetrock, I realized that day that I should go and be checked that night, just to be safe. So, I went to the emergency room, thinking they’d give me something for some sort of lung infection and send me right home. NARR: Right away, the doctors recognized that Ralph was having a heart attack and performed coronary bypass surgery. During open heart surgery, Ralph suffered two strokes. He didn’t wake up for three more weeks. POLAND: When I came out of my coma, had no feeling below my elbows or my knees. Had no use of my hands, I couldn’t talk. I was a living vegetable for a better part of two and a half months after that. Had two neurologists come and see me every day. They would try to get me to do things and say things. I couldn’t talk, but they tried. I wondered whether they could understand any of it. I knew they were doing things to my feet, but I couldn’t figure out what it was because I didn’t feel anything. Later, I realized, they were poking to see if I was getting any feeling down there. So, finally, one day, one neurologist said to me, you’ll be lucky if you’re in a wheelchair the rest of your life. I couldn’t talk, so I couldn’t ask him why or anything, so that scared the heck out of me. I laid there thinking, Damn, I’m too young to be this way. There’s too much in life I still want to do. NARR: During a stroke, blood stops flowing to the brain. The brain cells become damaged and die, causing permanent damage and loss of speech and motor control. The strokes hit a sort of reset button for Ralph and he woke up unable to move or speak for many months. POLAND: I can only remember the effects I had afterwards. It’s like a head cold, but about a thousand times worse. Everything is a jumbled mess. It’s hard in the beginning to put two thoughts together to form anything, but after a while, you start piecing things back together. NARR: When Ralph could finally sit up, he was able to look at himself in the mirror. The stroke aged him thirty years and he didn’t recognize the face looking back at him. Ralph’s recovery was slow and painstaking. After months of rehabilitation, he could barely squeeze the water from a sponge. After many more months, he could stand on his feet. Eventually, he could walk the length of two floor tiles in ten minutes. But Ralph was determined to keep going. POLAND: I wanted to be able to get back to what I did before. This gave me more and more drive to do all the therapy I could because that’s the only way I was going to get better. There’s so many little things that you got to learn to do in order to do bigger things to eventually get to the point where you can care for yourself or do other tasks. So, it was frustrating to me because they’d ask me to do things I thought were pretty stupid. In my mind, I’d think well, that’s stupid. That’s pretty easy, but when I try to do it, it wasn’t so easy. Then, as time went on, I’d see I’d get better at it. NARR: Today, Ralph volunteers in a rehab unit. He works with patients and survivors of traumatic brain injuries. He lets them know what to expect and gives them hope for recovery. He educates the families of patients, as well. POLAND: There’s so much they got to be aware of in life now. Things like awareness of disabilities and barriers that you can unintentionally put in front of disabled people. But brain injury is one that nobody wants anything to do with. Once themselves or a loved one has one, they have to take a crash course in learning. It’s so much in itself, all alone, the fact that seeing that in their loved one, that they tend to just want to walk off. NARR: Ralph says he wouldn’t wish a brain injury on his worst enemy. It’s changed his life completely. Looking back, he remembers encouraging clients to build wheelchair accessible homes, in case they would some day require it. He didn’t think he’d be in a position so quickly to need similar services. POLAND: All the time, I’m thinking, I never have to face that for decades, People don’t tend to want to think about that, they do put blinders on, hoping that will never happen to them, but eventually disability will happen to us or somebody we know. So, we need to all become aware and be aware. NARR: A brain injury is a hardship for anyone, but particularly for Ralph who found meaning and made a living with his hands and with his words. He worked as a handyman, repairing buildings, doing construction and now he couldn’t feed himself. As a handyman, he was aware of the Americans with Disabilities Act. Often, he was contracted to build ramps and remodel houses to adapt to persons with disabilities. Now, he requires the same access and accommodations. Thanks to Goodwill Industries of Northern New England, an ADA compliant employer and enforcer, Ralph has received the rehab, care, and employment services he needs. POLAND: I realized then I’m lucky this all happened to me, again, at the time it did, because first, the heart attack, ten or twenty years earlier, wouldn’t had the technology; I would have died. The strokes, I could have died just from the strokes or been left in a vegetative state because not that long ago, they felt they couldn’t do anything for someone in that situation. Now, because of the Disability Act, instead of being forced to be a shut in, I can participate and get back into life again, which helps me to have self-esteem, self-hope and encouragement and get out there and doing things, instead of staying home and thinking, well, somebody else is going to do this for me. I learned how to go from my disability controlling me, to me controlling my disability. NARR: Before the stroke, Ralph was an active and vocal member of the York County Republicans and would speak openly on issues that were important to him. Now, it’s hard to get the right words out and they don’t sound the way he would like. Ralph was single and independent before his operation and in the last ten years, he’s had to rely on strangers, friends, and family for assistance. Yet, none of this holds him back or gets him down. He says he’s lucky and credits the Americans with Disabilities Act for what he’s accomplished since his strokes. For the first time in his life, Ralph has close friends from a brain injury support group, he’s reconnected with his siblings, and has coworkers at Wal-Mart where he works. In an unexpected way, Ralph’s disability has given him more human connections than he ever had before. I’m Keith Ludden. This segment of our series on the 25th anniversary of the Americans With Disabilities Act was recorded, written, and produced by Molly Graham. Our series is funded in part by the Maine Humanities Council, in partnership with the Maine Arts Commission, Oral History and Folklife Research, Alpha One Independent Living Center, WMPG, and the Disability Rights Center of Maine.